This fly craft would make a great bulletin board display for science class. The finished fly is 15 inches long. 1. Fold a lunch-sized paper plate in on the sides to make the fly's head shape, and paint it brown. 2. Cut a body shape from card stock (Heavy Paper) and paint it black, or use black paper. 3. Glue the head to the body. 4. Place your bubble wrap sheet over the paper plate head so that the smooth side of the bubble wraps is facing up. Draw eyes on the bubble wrap with a black marker where you want them to be attached to the paper plate. Cut out the eye shapes from the bubble wrap. 6. Press the bubble wrap eye shapes onto a black sheet of paper paint side down, and then gently peel the bubble wrap off. Let the paint dry and then cut them out and glue them to the paper plate face. 7. 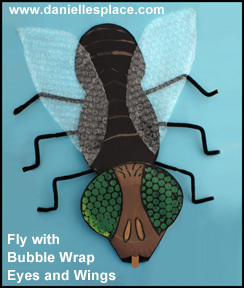 Cut wing shapes from the leftover bubble wrap and glue it to the fly's body. 8. To finish glue pipe cleaners to the underside of the fly and fold them to look like legs. 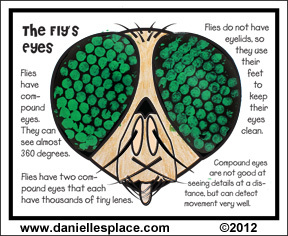 This activity sheet comes with interesting facts about compound eyes. 1. Print out the bug head pattern onto card stock (Heavy paper) A Pattern for this activity sheet is available to members. If you don't have a membership, you can just draw a picture of the bugs head. 2. Cut a piece of bubble wrap a little bit bigger than the bug's eyes. Place the bubble wrap over the eyes so that the bubble side is facing down. Trace around the eyes with a black marker. 3. Turn the bubble wrap back over and paint over the area that you traced. 4. Turn the painted side of the bubble wrap over and press it down on the eyes and then slowly peel it off. 5. When the paint is dry color the bug's head.